Actions, we are told, speak much louder than words. best that circumstances allow and is certainly much better than nothing. people might even begin to believe you! This thought is behind our commitment to those who are affected by imprisonment. 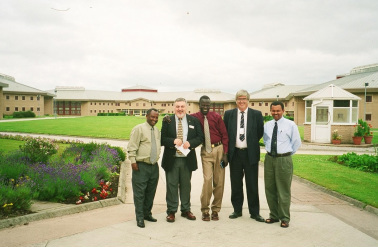 Ethiopian Prison officials visit a Young Offenders Institution in England. This is both the reason behind the action and the explanation of it. Our aim is to reflect God’s love and justice through practical projects, evangelism and teaching. We are committed to this approach, believing that God means what He says and has proved it by what He has done. His is the original Word with Action Strategy – see John 1: 1-3 - In the beginning was the Word, and the Word was with God and the Word was God. The same was in the beginning with God. All things were made by Him; and without him was not anything made that was made”. So, we can tell people in prison that we care. But there’s more – much more. We can also tell them that God cares and explain to them what He has done – at tremendous cost - to prove this. This means that the “Word” part of what we try to do is not only backed up by what we hope are our appropriate and helpful actions, but God has already acted so that we can take His Word into prison with us. The Word that can set prisoners free! Christianity is very practical. It is not just words and we see that historically it was Christians who brought about penal reform in England, established care for street children, and worked to abolish slavery. Although what we do may appear small in comparison to these great feats we have been able to do something. Among other things, this currently includes supporting efforts to improve prison conditions in Ethiopia. These efforts have ranged from visiting around 40 Ethiopian prisons to bringing people involved in prisons work in Ethiopia to the UK on brief study visits. Specifically through the Twinkle of Hope and Refuge Child Care and Dormitory Construction Projects efforts are being made to tackle the special needs of women and children in prison. Other practical projects include Skills training programmes, and water supply and sanitation projects. But with thousands of Ethiopian prisoners having come to faith in the Lord Jesus and keen to be studying the Bible and exploring what it means to be a Christian disciple there is a lot to do of a specifically Christian ministry nature. Some 100 prisons now have local Christian involvement and chapels are still needed in many of these as well as chaplains who can act as a link between outside and inside in addition to their primary role as pastors and teachers. With the help of sponsors, we support the entire JFA-PFE prison chaplaincy team. It is a tough assignment and with so much legitimate need elsewhere, this holistic approach to prison ministry can be difficult to resource. Through the developing Prisons Partnership Project prisoners in the UK are being encouraged to find ways through Acts of Kindness to support practical projects such as water supply and sanitation in Ethiopian prisons. Such projects not only enable these UK prisoners to enjoy doing something good for others, but can from time to time also provide opportunities for those who might not wish to be seen going to chapel to explore personal and faith questions in a relaxed manner on a one to one basis. So – our aim is to work on a Word with Action Strategy and we invite sympathetic Christian believers to consider joining us in this.